NEW YORK -- Call it an Easter surprise or an April Fool's Day story they'll never forget. 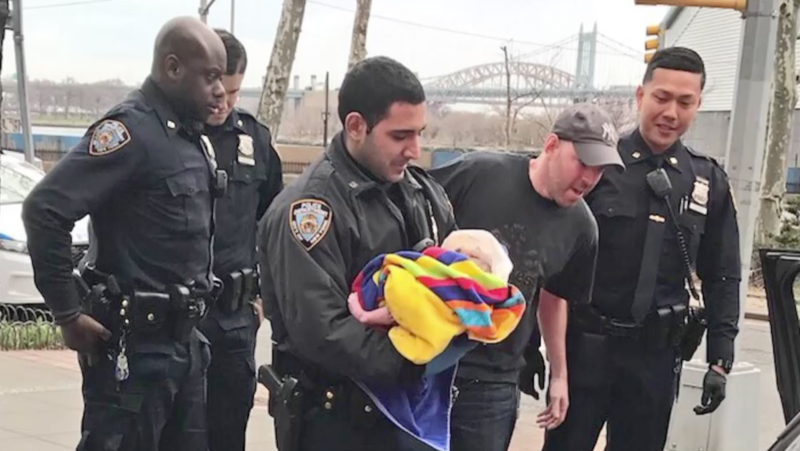 Two New York City Police Department (NYPD) officers helped a woman in labor deliver her baby on the side of the road on the Upper East Side on Sunday morning. CBS New York's Ali Bauman spoke with the parents at a hospital in Murray Hill. They said their baby girl, Claire, is healthy but her mother said she was sure eager to come into the world. The father said he is grateful for the two officers and for the 911 dispatcher who helped keep him calm until help arrived. When CBS New York spoke with the officers, they hadn't yet told their own families and weren't sure they'd even believe them thanks to April Fool's Day. Officer Stephen Koustoubardis said he responded the 911 call of a woman in labor around 8 a.m. Sunday. "At that time, we were flagged down by the husband that was already with her at the driver's side of the vehicle and pretty much delivering the baby in labor at that moment, and I stepped in and assisted the husband," Koustoubardis said. Officer Vincent Chiang admitted that police "don't normally handle these situations" and it felt great to help bring life into the world. Chiang has only been on the force for eight months and his partner eight years, but neither had ever been in a situation like this. "Training kicks in and you focus on doing what you gotta do," Koustoubardis said. The parents said the delivery lasted about five minutes, but it wasn't until baby Claire was safe in the hospital that everyone could take a sigh of relief. "It feels fantastic, a natural high feeling of being happy in life," Koustoubardis said.